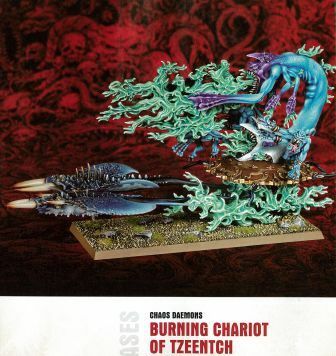 So the pictures of the new Daemons of Chaos from March White Dwarf have hit the internet (Hat Tip: Little Timmy Joss at Plastic Krak). With the Heralds, this being Ms. Slaanesh 2013, it is almost as though they were deliberately restrained. Second Chariot, this one with Herald. 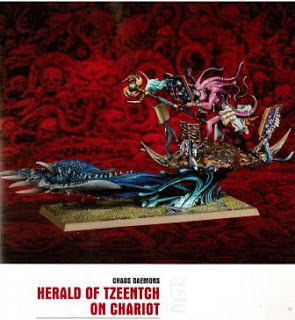 I particularly like the Tzeentch Herald on chariot and the Plague Drones. Most of the rest are okay, if uninspiring. A bit meh on the Skull Cannon. Daemons with cannons... oh joy! 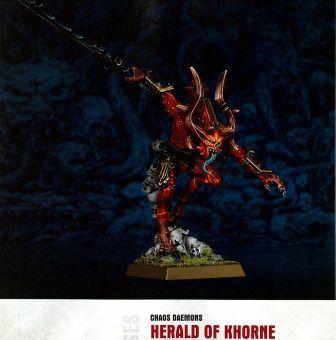 A Khorne cannon...Really?? 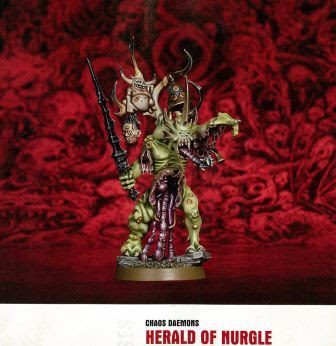 Love the Nurgle Herald and Drones. Burning chariot looks like it is covered in seaweed. I really hope its a flame cannon, rather than an actual cannon... Either way I probably won't take one on principle but seriously, the world does not need more cannons! Tom says "They had me at cannon"
Oh goody! So Tom can push 90 letters at us (or whatever the new Daemon equivalent is) and shoot us with cannons! Nice job GW! The flames on the chariot don't give the impression of movement at all! Skull cannon suggests to me a 'normal' cannon not flame. Agree re Warhamner not needing more cannons. Makes too many models unusable. I hope so, My 90 daemonettes will have a field day! As an Empire player, I welcome our Daemon brothers and sisters to the Free Association of Cannon Experts' Robust Organisation of Lonely Long Range Shooting, otherwise known as FACEROLLRS. Thank you brother Sigmarcannon, we've long awaited this invite. Bugger.... I was really hoping to not like any of the new Daemon models but I do. I have been wanting a second army for a while but want something quite different from what I have (Skaven) this looks like I could make a fairly small elite (and fast) army with models that I like. Only downside is that I see a lot of people going WOC & DOC in the near future until it settles in a bit. Bloodletters are now 14 points and strength 4. 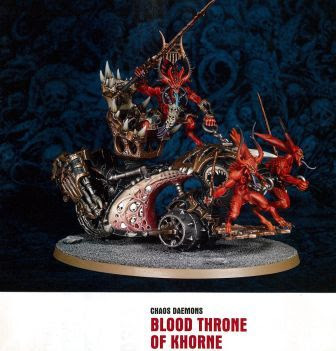 I'm not sure about the Khorne vehicle thingys; the Segway of Blood, the Golfcart of Skulls and the Mobility Scooter of Doom. Khorne rolls hard, but he don't roll cross-country. Finally, I can turtle in the corner and shoot Skullcannons at everyone. Simon it's safe for you to play daemons now. I'm not a Nurgle fan, but for those who are, would the plague drones look better if you cut off the trunks, and replaced them with a long spike? Like a mosquito feeding tube/probiscus. 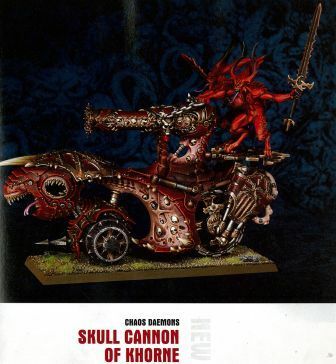 From reading through the new WD it looks like the Skull cannons actually fire skulls (the painting section mentions the detailing of the skull ammunition showing through the body of the cannon). It mentions 36" range too and large template but I think that was the 40k variant. If the Fantasy version fires a large template there will be so many of these damn things running about! 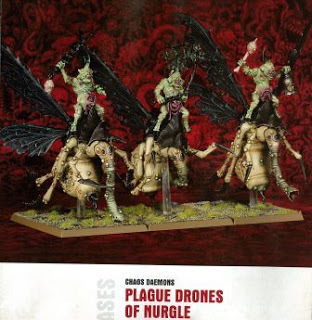 @ Tane from the WD it seems like there is a choice of heads for the Plague Drones the trunk one is just one varient, not sure why they just seem to show that one head in all the pictures though. It also mentions upgrades for the drones with spiked tail & probiscus that upgrades the poison to a 3+?